Too small. You need more circuit breakers for new appliances or remodel, breakers are tripping or fuses blowing. Unsafe. Older Aluminum wiring, melted bus bars, fuses or an older electrical panel are all good reasons to update you electrical panel. More information about unsafe electrical panels. You might also need to upgrade your electric service. That includes new meter socket, service entrance conductors, riser (mast), service head and proper grounding. More here. The correct name is “load center”. The electrical panel can also be called a “panelboard”, “fuse box”, “circuit breaker panel”, “circuit breaker box”, “electrical box”, or “electrical service”. 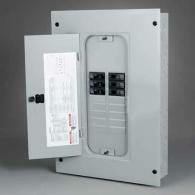 Electrical panel houses circuit breakers and distributes power throughout the house. If too much current (power) were to flow into the wires in your home, they could melt and possibly start a fire. If you were to accidentally touch a damaged overloaded wire, you could receive an electrical shock and possibly get electrocuted. To prevent more electrical flow than the wires are designed for, your breakers in the electrical service panel are supposed to detect the problem and stop the flow (break the circuit). Either blow the fuse or trip the breaker. Properly functioning circuit breakers (or fuses) are vital for your safety and the safety of your home. Your electrical panel also needs to be big enough to handle your family’s electrical needs. If you add a room to your house, add central air conditioning unit or electric cloth dryer, you may need a bigger panel to handle the increased electrical load. This is called a “panel upgrade” or “service upgrade”. When you add large load to your panel e.g. a new central air unit. Often panel upgrades are needed when you decide to remodel your kitchen or add rooms to your house. Don’t assume your home automatically provides the additional power you need. Adding an double oven, hot tub, spa, power equipment in your garage, etc. Call us at 312-404-6948 to schedule free consultation about your electric service. The electrical panels that are available nowadays are safe and well designed. However, the same doesn’t apply to older panels you might have at home. Some may be a fire or a shock hazard. Pushmatic breakers are very unreliable. The indicator flag is supposed to show whether the circuit is on or off. Many times this on/off flag will stay fixed in either position, giving homeowner a false indication of the condition of the circuit. If the circuit breaker is not not used (exercised) and serviced regularly they become stiff and difficult to operate or reset.They may trip easily for no apparent reason. Sometimes they “stick” and won’t break the circuit.This can possibly cause a short circuit or overload, which can lead to a fire. Also pushmatic breakers only have thermal trip mechanism. All modern breaker also have magnetic trip mechanism in addition to the thermal one. 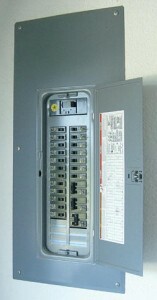 Many pushamatic panels don’t have a main breaker which is another safety issue. FPE panels are still in many homes throughout the USA built between 1950s and 1980s. FPE was involved in a class action lawsuit in New Jersey and the state court ruled that FPE knowingly distributed circuit breakers that were not tested to meet UL standards.These panels are unsafe and according to U.S. Consumer Product Safety Commission should be considered safety defect and be replaced. Read more about FPE Stab-Lok Panels here. These are infamous for melted circuit breakers or bus bars. Zinsco panels may seem to work properly for years and the problems are not easy to spot even with the panel cover off. It’s not uncommon to find a breaker that can not be removed from the bus bar because they are welded together. Sometimes, the breaker appear to be off while they still allow current to flow. Again, these should be replaced and upgraded to a new modern panel with circuit breakers.